While so many critics panned this film, I personally think Batman v Superman: Dawn of Justice is one of the best superhero films ever made. It is more geared towards an adult audience than the Marvel Cinematic Universe offers. In my opinion, Batman v Superman: Dawn of Justice is one of the most underrated movies of the year so far. It had everything an adult action film should have. It was fast paced, full of explosions, had a real plot and great CGI. I can't understand why it received such bad reviews when it ran in theaters, but I for one plan to own the extended cut 4K Blu-ray, as I think it would be a terrific addition to my collection. All Superman (Henry Cavill; The Man from U.NC.L.E.) is trying to do is use his powers to help humanity, but, when things go wrong, he is blamed for the loss of innocent civilians and damage to cities all over the world. Leading the charge is Bruce Wayne, A.K.A Batman (Ben Affleck; Argo), whose property was destroyed and whose workers were damaged in the epic battle at the end of Man of Steel. With a personal vendetta against Superman, Batman plots his way to the climactic final battle with the goal to destroy Superman once and for all. 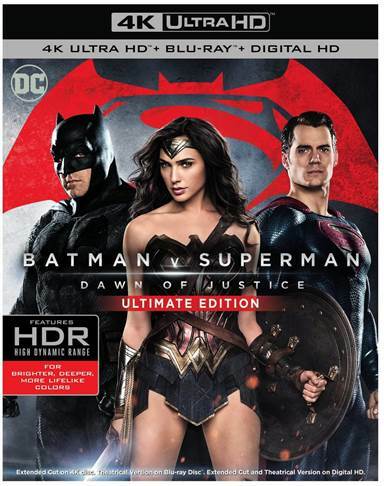 What makes this extended cut 4k Blu-ray different than the theatrical release is 30 additional minutes of footage that explains more of the back-story behind Superman and why he is being persecuted. It ties the loose ends up nicely and helps the movie flow more seamlessly. It is also R rated so there is more violence. And more graphic fight scenes. There is also more insight into Lex Luthor and his psychosis, which we didn't originally understand. The 4k version is also an incredible way to watch this film. The picture quality is outstanding. The muted pallet that director Zack Snyder (Man of Steel) uses for the film truly shines through. Colors are spot on and crystal clear. Textures are easily seen and the CGI effects that normally very noticeable on 4k transfers are extremely hard to spot. The audio presented in Dolby Atmos is the truly impressive. The soundtrack has crystal clear dialog as well as impressive special effects that make use of all the speakers in your home theater configuration including the Dolby Atmos "height" speakers. The extended cut of Batman v. Superman: Dawn of Justice includes 30 more minutes of film than was released. It also includes the Theatrical Version of the film, a Digital HD version, and over two hours of bonus content. Being a huge fan of the film, I was eager to dive into the bonus content; however, I was a little dismayed when I found most of it was just fluff for the upcoming Justice League movie. I personally would have enjoyed seeing more about the making of this masterpiece with more insight into the filming, story boarding, special effects and directing. While so many critics panned this film, I personally think Batman v Superman: Dawn of Justice is one of the best superhero films ever made. It is more geared towards an adult audience than the Marvel Cinematic Universe offers. I find it refreshing and engaging and just simply entertaining. Download Batman v Superman: Dawn of Justice from the iTunes Store in Digial HD. For more information about Batman v Superman: Dawn of Justice visit the FlickDirect Movie Database.